Feel free to use this printable soccer field for practice or game day planning. Back in the day when soccer was in its infancy, soccer field layout was rather irregular in its dimensions and this created several problems for the players. One player from, say, York would play on a field that was 60 yards long, while the guys in Liverpool would play on one that was 140 yards. Obviously, when either team played on the competitor’s field, they were at a loss. That is why, over time, soccer field dimensions were regulated, first by the Football Association, the first soccer organization in history, created by the English in the late 19th century, then by FIFA. Today’s dimensions of soccer fields still offer some room for variation, because not all pitches can be made on a same exact perimeter. So, the width of the field can range from 50 to 100 yards officially, but it’s rarely the case with modern soccer fields that they hit these extremes. The length can range from 100 yards to 130, but you can’t have a pitch that would be 100 yards wide and 100 yards long, obviously. The field is split in half by a center line, which has a symmetrical distance towards each of the widths and there is a center circle at the middle of this line, which is always 10 yards in diameter. This circle ensures that opposing players are kept at a safe distance when the team in possession kicks off. The goal must be 24 feet wide and 8 feet high and it must be placed exactly on the middle of the pitch’s width. The goal is surrounded by two boxes. The first one, called the protection box or the goalkeeper box is 6 yards wide and long and in this area, the keeper is said to be protected: any contact with the goalkeeper in this area will produce a foul for the defending team. The bigger box, also called the penalty box or penalty area is 18 yards wide and 44 long and in this area, every foul from the defending team will produce a penalty kick, which is taken from 12 yards from the goal, with just the attacker and the goalkeeper facing off. This is usually a sure goal, so you might not want to be so aggressive around the penalty box. Let’s take a look at some of the other soccer field dimensions that aren’t usually that important, but can still regulate the game a bit further. The corner circle is set around the corner flag and is 1 yard in diameter. Basically, when a player takes a corner, he can place the ball anywhere inside this circle so he can more comfortably hit the ball and give it a swirl. Otherwise, it’s very difficult to keep the ball inside the soccer field dimensions if you’re striking the corner from right, but with your left leg, or vice-versa. 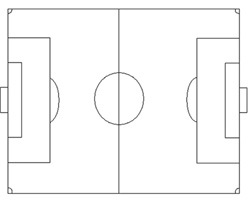 The penalty box circle is one of the soccer field dimensions that are used mostly for orientation by the referee. It’s situated around the penalty spot, 10 yards around it and it’s sole purpose is to allow the referee to figure out the correct wall distance in case of a free kick that’s near the box. For example, if the attacking team gets a free kick outside the edge of the penalty area, the referee will automatically know that the defending team’s wall should be placed at the penalty spot, which is 10 yards away, the correct distance the wall should stay in. These soccer field dimensions are standardized for all of the modern pitches, but the game will play differently on various sized fields. For example, on a very wide pitch, wing game play is bound to be more efficient, because your wingers will have a lot more room to maneuver in. Short fields benefit players with great speed and technique that can solve a one-on-one duel in close quarters. Long fields benefit speedy players, that love to hit the ball forward and make a run for it and they’re a nightmare for defenders that lack the speed to cope with them. Longer fields also require more coordination between lines, otherwise a team might allow the opponent far more spaces than they would like to. 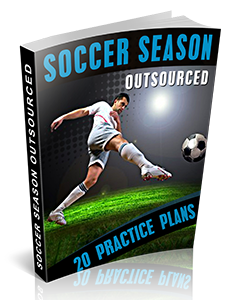 Niv Orlian is the author and the owner of a Soccer Fans website that provides information on various topics related to soccer.